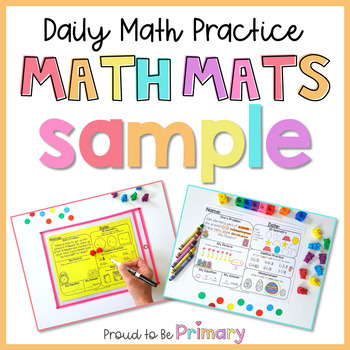 FREE Math Mats Sampler ~ Daily Math Practice included 4 different Math Mats to try out! Each mat has 4 different math skills and standards on it for students to practice and review. The complete resource is comprehensive and provides a lot of spiraling math practice each month. Questions and activities on addition, subtraction, word problems, 2D and 3D geometry and shapes, measurement, time, numbers to 100, place value, graphing, money, patterns, and more! Buy the bundle HERE and SAVE $9 (2 packs for FREE)! The BUNDLE is a collection of 10 monthly Math Mat resources. View the individual Math Mats products available HERE! Check out a detailed blog post about Math Mats HERE! Look at the PREVIEW for a look at the 4 ways to use Math Mats and a breakdown of what a Math Mat looks like and how it can be used. The activities align to the Common Core standards for first grade. This is perfect for first grade, but could also be used for a challenge in Kindergarten and for extra practice/as review for second grade. Additional pages are provided for Canadian users. Additional pages include Canadian spelling and Canadian money. 4 ways to use Math Mats in your classroom! 1. Print on cardstock & laminate. Use with white board markers during your math centers! 2. Photocopy with the booklet cover and staple into a booklet. 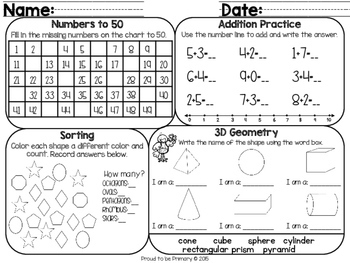 Have your students complete 1 mat a day for morning work or for extra practice during math workshop! 3. 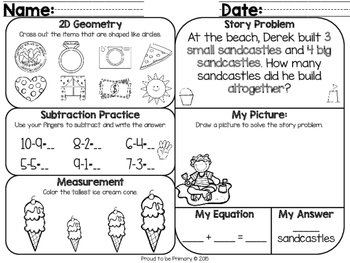 Shrink the pages and have your students use the mats in their Interactive Math Notebooks! 4. 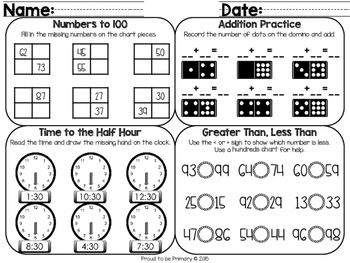 Photocopy and place into a math folder to practice each day.